This guide provides criteria for the design, installation, and operation of piping systems that contain or may contain flammable vapor mixtures to prevent and protect against damage from deflagrations or detonations due to combustion of flammable atmospheres therein. 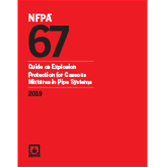 NFPA members and public sector officials may submit a question on an NFPA code or standard. Responses are provided by NFPA staff on an informal basis.